Big Data is everywhere and there is almost an urgent need to collect and preserve whatever data is being generated, for the fear of missing out on something important. There is a huge amount of data floating around. What we do with it is all that matters right now. This is why Big Data Analytics is in the frontiers of IT. Big Data Analytics has become crucial as it aids in improving business, decision makings and providing the biggest edge over the competitors. This applies for organizations as well as professionals in the Analytics domain. For professionals, who are skilled in Big Data Analytics, there is an ocean of opportunities out there. If you are still not convinced by the fact that Big Data Analytics is one of the hottest skills, here are 10 more reasons for you to see the big picture. Jeanne Harris, senior executive at Accenture Institute for High Performance, has stressed the significance of analytics professionals by saying, “…data is useless without the skill to analyze it.” There are more job opportunities in Big Data management and Analytics than there were last year and many IT professionals are prepared to invest time and money for the training. The demand for Analytics skill is going up steadily but there is a huge deficit on the supply side. This is happening globally and is not restricted to any part of geography. In spite of Big Data Analytics being a ‘Hot’ job, there is still a large number of unfilled jobs across the globe due to shortage of required skill. A McKinsey Global Institute study states that the US will face a shortage of about 190,000 data scientists and 1.5 million managers and analysts who can understand and make decisions using Big Data by 2018. Strong demand for Data Analytics skills is boosting the wages for qualified professionals and making Big Data pay big bucks for the right skill. This phenomenon is being seen globally where countries like Australia and the U.K are witnessing this ‘Moolah Marathon’. According to the 2016 Skills and Salary Survey Report published by the Institute of Analytics Professionals of Australia (IAPA), the annual median salary for data analysts is $130,000, up four per cent from last year. 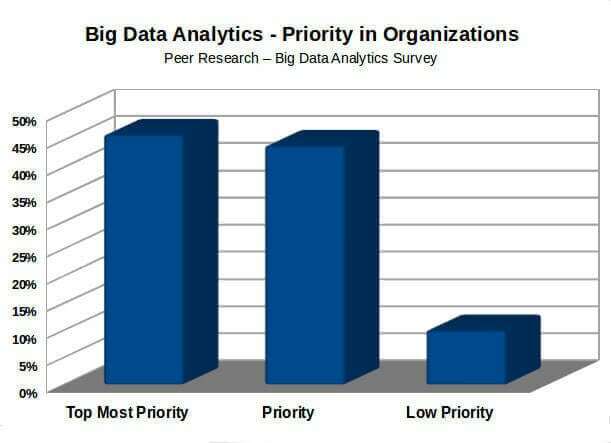 According to the ‘Peer Research – Big Data Analytics’ survey, it was concluded that Big Data Analytics is one of the top priorities of the organizations participating in the survey as they believe that it improves the performances of their organizations. Based on the responses, it was found that approximately 45% of the surveyed believe that Big Data analytics will enable much more precise business insights, 38% are looking to use Analytics to recognize sales and market opportunities. More than 60% of the respondents are depending on Big Data Analytics to boost the organization’s social media marketing abilities. The QuinStreet research based on their survey also back the fact that Analytics is the need of the hour, where 77% of the respondents consider Big Data Analytics a top priority. A survey by Deloitte, Technology in the Mid-Market; Perspectives and Priorities, reports that executives clearly see the value of analytics. Based on the survey, 65.2% of respondents are using some form of analytics that is helping their business needs. The image below clearly depicts their attitude and belief towards Big Data Analytics. New technologies are now making it easier to perform increasingly sophisticated data analytics on a very large and diverse datasets. This is evident as the report from The Data Warehousing Institute (TDWI) shows. According to this report, more than a third of the respondents are currently using some form of advanced analytics on Big Data, for Business Intelligence, Predictive Analytics and Data Mining tasks. With Big Data Analytics providing an edge over the competition, the rate of implementation of the necessary Analytics tools has increased exponentially. 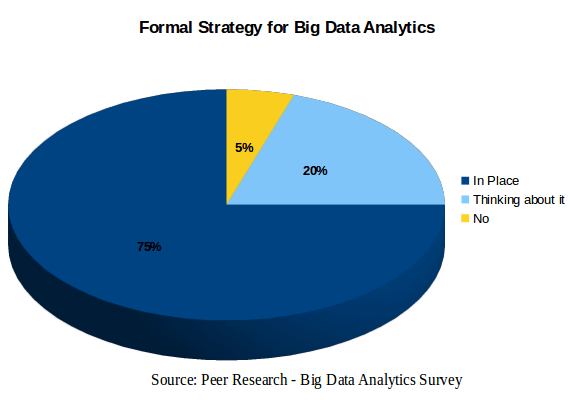 In fact, most of the respondents of the ‘Peer Research – Big Data Analytics’ survey reported that they already have a strategy setup for dealing with Big Data Analytics. And those who are yet to come up with a strategy are also in the process of planning for it. 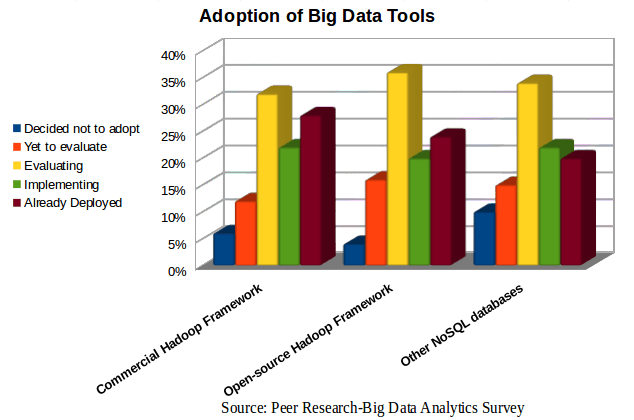 When it comes to Big Data Analytics tools, the adoption of Apache Hadoop framework continues to be the popular choice. There are various commercial and open-source frameworks to choose from and organizations are making the appropriate choice based on their requirement. Over half of the respondents have already deployed or are currently implementing a Hadoop distribution. Out of them, a quarter of the respondents have deployed open-source framework, which is twice the number of organizations that have deployed a commercial distribution of the Hadoop framework. Analytics is a key competitive resource for many companies. There is no doubt about that. According to the ‘Analytics Advantage’ survey overseen by Tom Davenport, ninety six percent of respondents feel that analytics will become more important to their organizations in the next three years. This is because there is a huge amount of data that is not being used and at this point, only rudimentary analytics is being done. About forty nine percent of the respondents strongly believe that analytics is a key factor in better decision-making capabilities. Another sixteen percent like it for its superior key strategic initiatives. Even though there is a fight for the title of ‘Greatest Benefit of Big Data Analytics’, one thing is undeniable and stands out the most: Analytics play an important role in driving business strategy and making effective business decisions. 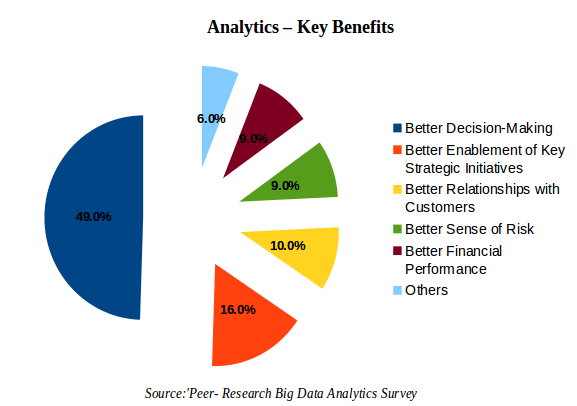 Seventy Four percent of the respondents of the ‘Peer-Research Big Data Analytics Survey’ have agreed that Big Data Analytics is adding value to their organization and allows vital information for making timely and effective business decisions of great importance. This is a clear indicator than Big Data Analytics is here to stay and a career in it is the wisest decision one can make. 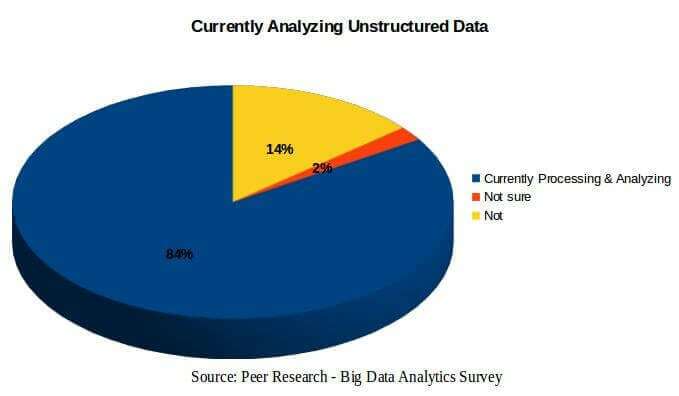 The ‘Peer Research – Big Data Analytics’ survey clearly reports that there is a huge growth when it comes to unstructured and semistructured data analytics. Eighty four percent of the respondents have mentioned that the organization they work for are currently processing and analyzing unstructured data sources, including weblogs, social media, e-mail, photos, and video. The remaining respondents have indicated that steps are being taken to implement them in the next 12 to 18 months. 8. Big Data Analytics is Used Everywhere! It is a given that there is a huge demand for Big Data Analytics owing to its awesome features. The tremendous growth is also due to the varied domain across which Analytics is being utilized. The image below depicts the job opportunities across various domains. 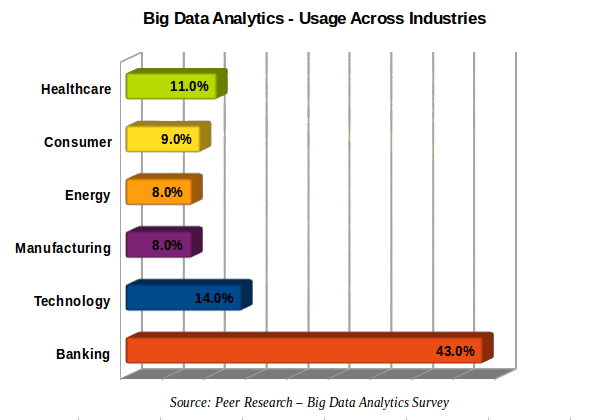 According to IDC, the Big Data Analytics market will reach $125 billion worldwide in 2015. IIA states that Big Data Analytics tools will be the first line of defense, combining machine learning, text mining and ontology modeling to provide holistic and integrated security threat prediction, detection, and deterrence and prevention programs. 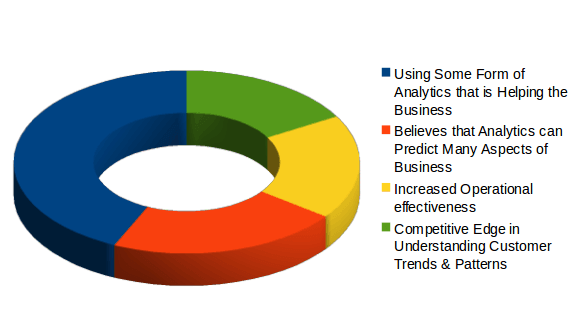 According to the survey ‘The Future of Big Data Analytics – Global Market and Technologies Forecast – 2015-2020’, Big Data Analytics Global Market will grow by 14.4% CAGR over this period. The Big Data Analytics Global Market for Apps and Analytics Technology will grow by 28.2% CAGR, for Cloud Technology will grow by 16.1% CAGR, for Computing Technology will grow by 7.1% CAGR, for NoSQL Technology will grow by 18.9% CAGR over the entire 2015-2020 period. From a career point of view, there are so many option available, in terms of domain as well as nature of job. Since Analytics is utilized in varied fields, there are numerous job titles for one to choose from. Big Data Analytics career is deep and one can choose from the 3 types of data analytics depending on the Big Data environment. Previous: Previous post: Are you on the right cloud computing career path?